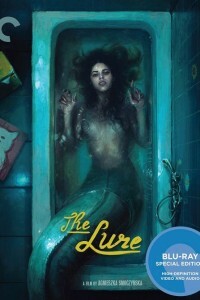 The Lure DVD is a genre-defying horror-musical mash-up – the bold debut of Polish director Agnieszka Smoczyńska – follows a pair of carnivorous mermaid sisters drawn ashore to explore life on land in an alternate 1980s Poland. Their tantalizing siren songs and otherworldly auras make them overnight sensations as nightclub singers in the half-glam, half-decrepit world of Smoczyńska’s imagining. The director gives fierce teeth to her viscerally sensual, darkly feminist twist on Hans Christian Andersen’s “The Little Mermaid,” in which the girls’ bond is tested and their survival threatened after one sister falls for a human. A coming-of-age fairy tale with a catchy synth-fueled soundtrack, outrageous song-and-dance numbers, and lavishly grimy sets, The Lure explores its themes of emerging female sexuality, exploitation, and the compromises of adulthood with savage energy and originality.